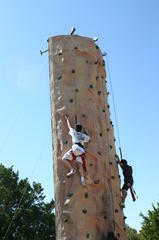 Climbing fun is sure to be a great fundraiser or event activity. Strap into a harness and let us connect you to the wall. Try your best to get the top and ring the buzzer before anyone else can. Cheers are sure to ring with the rockwall! Includes one staff to operate the wall. We recommend you provide two additional volunteers to assist with harnesses.